The Susquehannock were once one of the most formidable tribes of the mid-Atlantic region at the time of European contact. They dominated the area between the Potomac River in North Virginia and southern New York State. Little is known about them, since they lived some distance inland, and Europeans did not often visit their villages before they had been destroyed by epidemic and wars with the Iroquois in 1675. The Susquehannock have been called noble and heroic. 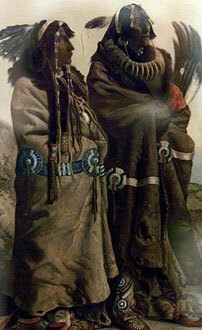 They have also been described as aggressive, warlike, imperialistic, and bitter enemies of the Iroquois. 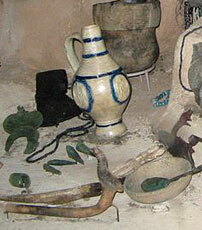 They may also have warred with the Mahican from the central Hudson Valley. When he first met the Susquehannock in 1608, Captain John Smith was especially impressed with their size, deep voices, and the variety of their weapons. Their height must have been exceptional, because the Swedes also commented on it thirty years later. 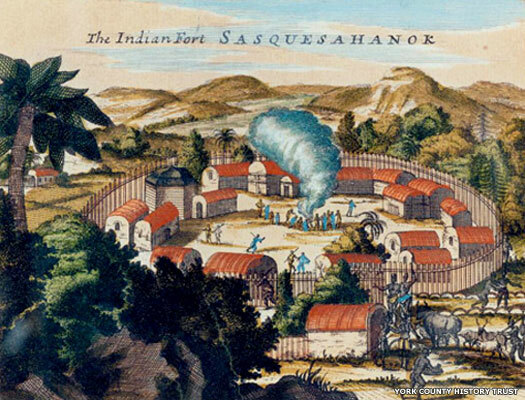 The constant warfare between Iroquian-speaking tribes gave the Susquehannock a military advantage over their more peaceful Algonquin neighbours to the east and south. Using canoes for transport, Susquehannock war parties routinely attacked the Delaware tribes along the Delaware River and travelled down the Susquehanna where they terrorised the Nanticoke, Conoy, and Powhatan living on Chesapeake Bay. They lived in a number of large, fortified villages (perhaps as many as twenty) which stretched along the Susquehanna River and its branches. They were allies and trading partners of the Erie in North Ohio and the Huron and Neutrals of southern Ontario. Little is known about their political and social organisation, but it can be safely assumed that it was similar to the Iroquois who lived just north of them in upstate New York. There is every chance that the Susquehannock were in fact a confederacy of at least five tribes (which are named in their king list page) but apart from these names and those of several chiefs and leaders, very little is known. Clans were almost certainly matrilineal (with their descent traced through the mother), and 'Turtle ('Terrapin'), 'Fox', and 'Wolf' have been mentioned as putative names. Like other Iroquoian-speaking tribes, the Susquehannock farmed extensively. In the spring, they planted maize, beans, and squash in the fields near their villages. After this was finished, many groups moved south for the summer to temporary sites on Chesapeake Bay to fish and gather shellfish, returning in the autumn to harvest their crops and to hunt.